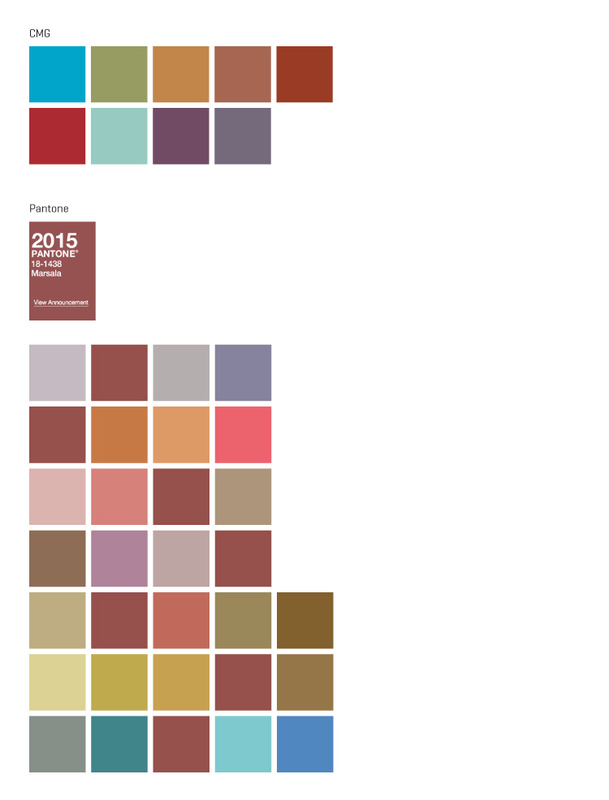 Over the past three years, we have seen a surprising amount of shift in color trends. 2014 was light and warm. There were a few popular saturated colors, we saw the start of more natural “mineral” colors, and nothing dipped too dark. 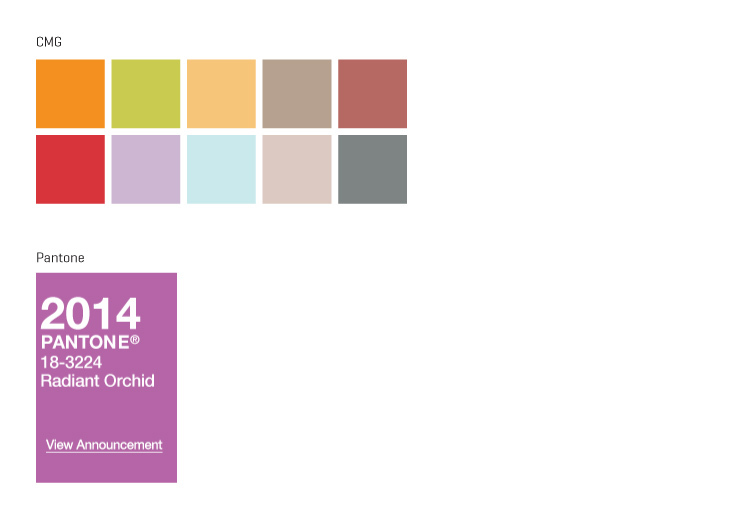 “Radiant Orchid” was the Pantone color of the year and it sat among the contrast of a warmer, cheerier palette from Color Marketing Group. 2015 dipped much darker, however, and hung out in the pinks, reds, and oranges heavily. Greens and yellows tended to oppose each other in warmth. Keeping in stride with CMG’s palette, the Pantone color of the year was “Marsala”, which continually sprouted close friends throughout their own palettes by way of orange and warm pinks. 2016 had a lot of contrast in the light/dark department and stayed quite muted, with just a handful becoming more saturated. The earthy “mineral” colors were quite popular, and most colors from that year were likely drawn from nature. There were many colors in the palettes that were nearly the same. Pantone’s color of the year was Rose Quartz and Serenity, which felt airy, feminine and ethereal, and was touched on in CMG’s palette. 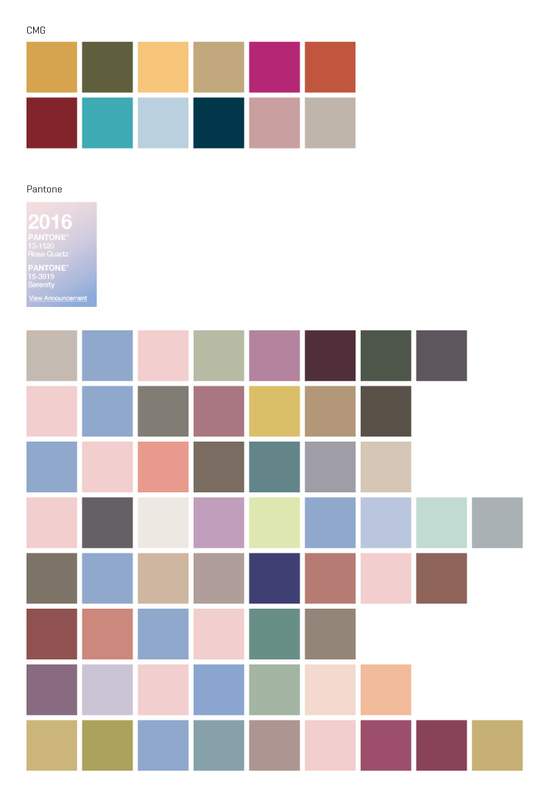 According to Pantone, 2017 is starting to have more punch. With “Greenery” as the color of the year, it’s leaning heavily on nature again, with many of those colors sinking darker. Saturated colors and jewel tones are making their way back in amongst deep purples, blues, browns and greens, not unlike colors you would see in the shadows of a forest. The only color released by the Color Marketing Group at this point is a natural-leaning green called “Life Spurt”, not unlike Pantone’s “Greenery”. There are always many theories on why color trends change, namely economics, pop culture, and political/social climate. Generally when economics are tough, you see brights. You see pop culture more directly influencing the palettes (say Bollywood suddenly becomes more popular than it is—you may see some more Indian influences in the palettes). 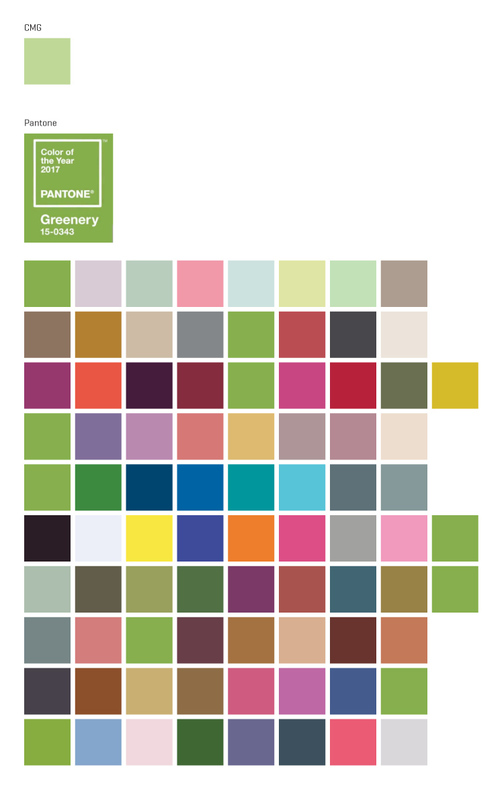 This year I feel the incline of political/social tensions dominating pop culture in the arena of importance, which is interesting when you see the deep, pensive colors in the Pantone palette, paired with a few fiery brights and the calm, saturated “Greenery”. It has the feeling of a retreat into the forest for reflection, thought, and maybe even a wee bit of sanity. What are your thoughts on the 2017 colors? How do you foresee them interacting with your life?